Until Recently I Have Not Been Convinced By Any Eating Plan. It has taken me several years to get to the point of admitting that I really didn’t know what to make of the food issue. Like so many practitioners I have been introduced to a great number of dietary theories – from food combining to ‘alkaline’ food consumption, and yet on investigation these all seem based on pseudo-science and poor physiological understanding. Furthermore I found that on testing, none of the proposed ‘solutions’ was reliable. Certainly all of the solutions work SOME of the time, but I now acknowledge it is for the wrong reason. The one common theme in all diets is EXCLUSION – and frequently exclusion of similar foods. There is a growing awareness that certain foods do more harm than good, and naturopaths the world over are now wary of wheat or gluten and dairy or casein. The sheer number of individuals who report tremendous benefits on stopping the consumption of grains, milk or cheese for example, compared to the lack of people reporting a remarkable benefit from the introduction of any particular food, seems to confirm that the exclusion of troublesome foods is more critical than the inclusion of the beneficial ones. Not only do certain foods cause inflammation in certain individuals, but they can also lead to malabsorption of many vitamins, minerals and trace minerals, leading to further complciations. So which are the foods to avoid? Experience has shown that there are some common culprits, including Wheat, Dairy, Coffee, Tea, Sugar, Citrus, Potato, and Tomato. But no two people are the same and there is NO fixed answer to the question of what YOU personally should eat. It has therefore been with GREAT relief that I have finally found the solution! A Doctor with decades of successes, helping patients entirely by eliminating their personal allergenic foods. And what is more, he has written a book which makes it easy for all of us to repeat his success. The Doctor’s name is Keith Scott-Mumby and I strongly recommend you follow the process laid out in his book ‘Diet Wise’. The majority of people’s health will improve in 5 days. From there you will discover the foods that you never knew were poisonous to you, and in just a couple of weeks you will know for sure how to keep one of the most consistent stressors from affecting your health. 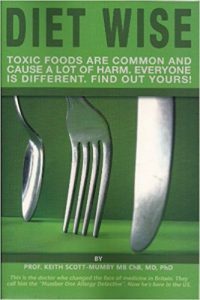 This book will teach you a rapid and practical way of discovering your personal food intolerances. I shall return to this page to discuss just how important that is, but for now let’s just note that it might resolve all your symptoms. Another aspect of food which I shall cover here in greater depth later on, is the deception we are all being subjected to by the food industry. Make no mistake, processed food is not safe. Extracting a nutrient from a food and combining it with other nutrients DOES NOT make a new food! Please remember this if nothing else. The biggest scandal of the food industry which we MUST all be awake to is the inclusion of FRUCTOSE in processed foods. This innocuous sounding ‘fruit sugar’ is a massive contributor to the tidal wave of obesity, type 2 diabetes, hypertension, cardiovascular disease and more. Fructose was never intended to escape the confines of the fruits in which it is found. It is only safe in tiny amounts and can be metabolised only with the fiber and other nutrients nature so brilliantly packaged it with. Once it is free from its natural confines, this sugar (most notably found as High Fructose Corn Syrup HFCS) is a poison. Glucose sugar, is the fuel of life. It is metabolised by every cell in the body, from the brain to the kidneys. Fructose on the other hand can only be metabolised by the liver and is stored as fat! Not only this, but research clearly shows our brains don’t recognise it. If we eat glucose, a feedback system informs our brains that we are satisfied and our hunger mechanism is switched off. If we consume fructose, the hunger switch stays ON! Our brains are unaware we’ve eaten anything and drive us on to eat something sweet! Fructos is in soft drinks from Coke to Fanta. It is also in a vast number of processed foods, from soups and sauces to dairy and bread. It is even in baby foods. Do NOT give these to your children! We must all avoid HFCS and other Fructose additives. It converts immediately to fat and sets us up for diabetes, hypertension, cardiovascular disease including stroke, asthma, headaches and an endless list of associated health problems. Once outside a fruit, fructose is NOT a food. It is a POISON.